A man takes over the role as bookkeeper for a local cemetary. He discovers that he has the power to make people die at will through the use of a mystical cemetary map. CLICK IMAGE FOR DETAILS. I BURY THE LIVING (1958)/THE KILLER SHREWS (1959) - Killer Creature Double Feature. CLICK IMAGE FOR DETAILS. I BURY THE LIVING (1958)/THE SEVERED ARM (1975) - Double Feature. CLICK IMAGE FOR DETAILS. Stars Montgomery Clift, Anne Baxter and Karl Malden. Directed by Alfred Hitchcock. An intense one from Alfred Hitchcock. CLICK IMAGE FOR DETAILS. Stars Frederic March, Veronica Lake, Robert Benchley, Susan Hayward and Cecil Kellaway. Long before the "Betwitched" TV show, there was I MARRIED A WITCH. A wonderfully fun mix of humor and the supernatural. Political candidate Frederic March has married a witch (a real one!). Extras! Stars Don Glut, Bob Burns, Glenn Strange and an exciting cast of young people! 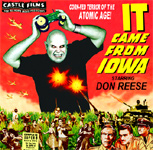 Legendary amateur film-maker Don Glut made scores of 16mm monster movies between 1953-1969. Two disc set. CLICK IMAGE FOR DETAILS. Stars Ralph Forbes, Marion Shilling and Malcolm McGregor. A city nightclub is the focal point of murder. A newspaper reporter gets involved (don't they all?) and follows the clues back to a close friend of his! CLICK IMAGE FOR DETAILS. This set includes: THE PIRATES OF BLOOD RIVER (1962), DEVIL SHIP PIRATES (1964), THE STRANGLERS OF BOMBAY (1960), and THE TERROR OF THE TONGS (with Chris Lee and Yvonne Monlaur). CLICK IMAGE FOR DETAILS. Four Movie Set: THE BLACK ROOM (1935), THE MAN THEY COULD NOT HANG (1939), BEFORE I HANG (1940), and THE BOOGIE MAN WILL GET YOU (1942) Stars Boris Karloff, Peter Lorre, Max Rosenbloom, Larry Parks, Jeff . CLICK IMAGE FOR DETAILS. Four Feature Films: CURSE OF THE MUMMY'S TOMB (1964), THE TWO FACES OF DR. JEKYLL (1960), THE GORGON (1964), and SCREAM OF FEAR (1961). CLICK IMAGE FOR DETAILS. ICONS OF HORROR: SAM KATZMAN - Five Feature Set: THE WEREWOLF (1956), ZOMBIES OF MORA TAU (1957), THE GIANT CLAW (1957), CREATURE WITH THE ATOM BRAIN (1956) and MYSTERIOUS ISLAND (1951 Serial Chapter). CLICK IMAGE FOR DETAILS. Movies will include THE H-MAN (1958), BATTLE IN OUTER SPACE (1959) and MOTHRA (1961). Stars Peter Cushing. Hammer thrillers: The Snorkel (1958), Full Treatment/Stop Me Before I Kill (1960), Never Take Sweets from a Stranger (1960), Cash on Demand (1961), Maniac (1963), and The Damned (1963). Stars Brian Donlevy, Charles Coburn, Ella Raines and Helen Walker. A business man's wife plans his murder. More twists, turns and shocks than you will expect. Great crime film noir. A documentary that examines the history and historic background on the Dracula legend through writings and film. Christopher Lee narrates. A highlight features Lee in make-up as Vlad The Impaler and as Count Dracula. Interesting footage from the actual Carpathian Mountains too. Stars Alex Rebar and Michael Aldredge. Reminiscent of FIRST MAN IN SPACE, this is the "gripping drama" of a poor guy that has just returned from the planet Saturn. His crew mates die from some type of radiation, but he survives...only to become a monster. Stars John Carradine, Robert (THE SUN DEMON) Clarke, Phyllis Coates Sheila Noonan. Carradine's back to his weird science ways. CLICK IMAGE FOR DETAILS. Grant Williams finds his shoes getting a bit floppy. His clothes are too baggy and before you know it the house cat is a serious threat! The exciting and sadly poignant science fiction classic. Stars Bruce Dern, Pat Priest and Casey Kasum! Wacky, gruesome film. Low-budget with a scientist and his assistant transplanting two heads on animals. When an escaped murderer shows up and is killed, they decide to step up the experiments with human subjects. Optional Riff-Track, trailer, interviews. A young man gets the whammy and is turned into a zombie (a mixed-up one). He begins a spree of violence and down right no-good behavior. A low budget cult legend. CLICK IMAGE FOR DETAILS. Lon Chaney Jr. gets electrocuted, then revived as a super-charged "man made monster." He's nicknamed "The Butcher," because of his murderous reputation. Electrifying fun! Lon Chaney Jr. gets electrocuted, then revived as a super-charged "man made monster." He's nicknamed "The Butcher," because of his murderous reputation. Electrifying fun! High Definition restoration. Bonus: Trailers, Chaney Featurette, Chaney LIVE!, Chaney TV show - THE WHISTLER. A weird movie that has slipped by over time. Made in the early 1970s, it has trappings of an old Italian Spaghetti western (although made in Australia) and a twisted update on PSYCHO. It takes place in 1896 at a backwoods hostel with a bounty hunter looking for a maniac. Some adult situations. Stars Charles Russell, Bill House, Mary Beth Hughes, Dale Belding and Fritz Leiber. A young boy sees a murderer disposing of a body. The boy is on the run as the murdering has marked him to be next. A thriller. Stars Charles Russell. A fortune teller reads the future of a young woman...with a grave warning. Her death is predicted to be aboard a train....true! Things intensify as the train pulls into a quiet town and the murderer hides out in boarding house. Others suspect. A chiller. Are the children possessed by the ghosts...or is the woman going mad? Chilling to the bone. Two scenes, in particular, will shake you...CLICK IMAGE FOR DETAILS. A serious silent horror film that looks like it's right out of 1922. Mysticism, strange happenings and the supernatural. A cross between VAMPYR and THE CAT and THE CANARY, with apparitions. It's very short, BUT HIGHLY recommended! Plus 4 bonus short, weird films! Click Image for details. Stars Rod LaRocque and Asrid Allwyn. Foreign agents are extorting the brother of a murdered man. The Shadow is on the scene. "Who knows what evil lurks....in the hearts of men..."
This set includes THE BLACK ROOM (1984), THE GIANT SPIDER INVASION (1975), INVASION FROM INNER EARTH (1974) and HOW AWFUL ABOUT ALLAN (1970). A really cool looking giant hairy beast is found stomping around a snowy mountain region. The monster terrorizes people in a cabin...great miniatures and effects. Also known as: TERROR IN THE MIDNIGHT SUN. INVASION OF THE BEE GIRLS (1973)/THE LAST WOMAN ON EARTH (1960). Double DVD Feature. CLICK IMAGE FOR DETAILS. Stars Kevin McCarthy, Dana Wynter and Carolyn Jones. The ultimate Cold War sci-fi thriller. Paranoia runs rampant as aliens plant seed pods near people as they sleep. A duplicate human grows in the seed pod. When it hatches, the original person is disposed of. INVASION OF THE NEPTUNE MEN (1961)/PRINCE OF SPACE (1959) - Double Feature. CLICK IMAGE FOR DETAILS. Midnite Movies: INVASION OF THE STAR CREATURES (1962)/INVASION OF THE BEE GIRLS (1973) - Double Feature. CLICK IMAGE fOR DETAILS. Stars Gerald Mohr, Peggie Castle, Dan O'Herlihy, Phyllis Coates, Robert Bice and Tom Kennedy. Well, this movie had to be stirring things up in 1952...petrifying an already spooked Red Scare America. CLICK IMAGE FOR DETAILS. Six Mexi-Wrestler movies with lots of monsters! Films include: THE VAMPIRES OF COYOACAN, HOUSE OF 7 MUMMIES, CHAMPIONS OF JUSTICE, CASTLE OF THE MUMMIES, MYSTERY OF BERMUDA, RETURN OF THE CHAMPIONS OF JUSTICE. All in Spanish, no subtitles. DVD set. Stars Richard Derr and Mark Daniels. Little know sci-fi mystery utilizing the famous "Shadow" character, who can turn invisible and track down the killer! CLICK IMAGE FOR DETAILS. Lugosi in a great poverty row flick. He is obsessed with his "dead" wife and develops a split personality. From kindly doctor, to insane murderer, Lugosi's hystronics and intensity are a sight to behold. Some cool under lighting adds class to this low budget entry. Restored by Film Detective. Lugosi in a great poverty row flick. He is obsessed with his "dead" wife and develops a split personality. CLICK IMAGE FOR DETAILS. Lugosi in a great poverty row flick. He is obsessed with his "dead" wife and develops a split personality. From kindly doctor, to insane murderer, Lugosi's hystronics and intensity are a sight to behold. Some cool under lighting adds a bit more class to this low budget entry. Re-mastered in HD. INVISIBLE GHOST/CARNIVAL OF SOULS - Double Feature. CLICK IMAGE FOR DETAILS. John Carradine and a host of atomic walking dead! Incredibly fun 50's Sci-Fi. John Agar swings into action atop a speeding van with special sonic equipment. It's Saturday afternoon fodder for us fans. Audio commentary by Tom Weaver and Dr. Robert Kriss. Trailer gallery too! INVISIBLE INVADERS (1959)/JOURNEY TO THE SEVENTH PLANET (1962) - Double Feature. CLICK IMAGE FOR DETAILS. Stars Roland Drew, Grace Bradley, Alex Callam and Jeanne Kelly. A newspaper repoter tries to one-up her boyfriend in the police department by solving a murder spree. CLICK IMAGE FOR DETAILS. Fun effects on this British TV series from the 1950s. 13 re-mastered episodes and almost 6 hours of invisibility! CLICK IMAGE FOR DETAILS. Fun effects on this British TV series from the 1950s. 13 re-mastered episodes and almost 6 hours of invisibility! All the Universal classic Invisible Man movies: THE INVISIBLE MAN (1933), THE INVISIBLE MAN RETURNS (1940), THE INVISIBLE WOMAN (1940), INVISIBLE AGENT (1942), THE INVISIBLE MAN'S REVENGE (1944), ABBOTT AND COSTELLO MEET THE INVISIBLE MAN (1951)...plus, documentary and extras. James Whale directs this fantasy-horror masterpiece with Claude Rains. A man discovers invisibility; the cost - his sanity. Dark humor and great pacing make this a timeless gem. Stars Richard Webb. A leader of the underworld acquires a bizarre chemical from another country that make people invisible in combination with a special light ray. His plans are to develop an invisible army and, well....you guessed it, rule the world! 12 chapter serial. Karloff and Lugosi in a really cool sci-fi/horror flick. Karloff harnesses cosmic rays that turn him into a glowing killer monster bent on revenge. Japanese produced super cyborg hero series! Lots of weird monsters, secret agents and colossal giants! Like ULTRAMAN, this was a favorite with Monster Boomer Kids! Almost eleven hours of shows, the complete series, on this multi-disc set. A group of explorers searching for a missing son in the Arctic discover a world unchanged by history. Living Vikings and the legendary Whale's Graveyard. High adventure and fantasy in a world out of the past. Stunning photography. Boris Karloff Set - ISLAND MONSTER (1953)/CHAMBER OF FEAR (1968) -Double Feature. CLICK IMAGE FOR DETAILS. Starring Boris Karloff. This is an Italian film dealing with a band of drug smugglers, secret agents, murder and kidnapping. Karloff plays one of the nasty guys in the dope ring. For collectors of film oddities. Bonus: HOLLYWOOD HOBBIES featuring Karloff in a field hockey match! Also Known As: MONSSON. Stars John Carradine, Gale Sondergaard, Sidney Toler, Frank Fenton, Rita Quigley and Betty Amann. Weird South Seas tale with John Carradine laying on the ham as a tough-guy sailor. CLICK IMAGE FOR DETAILS. Stars Charles Laughton and Bela Lugosi. A great horror flick that was banned in England for years. No one will top Laughton as the seedy-genius who turns beasts in to man-beasts on a remote island. Click image for details. Stars William Gargan, Wallace Ford, Gilbert Roland, and June Lang. A young woman pilot crash lands on a remote island in the Pacific. An underworld of gunrunners and illegals capture her for use in a neferious plan. ISLE OF THE DEAD (1945)/BEDLAM (1946) - Double Feature. CLICK IMAGE FOR DETAILS. Also known as: CULT OF THE DEAD, THE SNAKE PEOPLE and ISLE OF THE LIVING DEAD. A law official arrives on a remote island known for outlaws, crime and voodoo. He plans to clean-up the illegal operations and stop the slavery trade. However the voodoo thing gets in the way. One of Boris' final films. Also known as: CULT OF THE DEAD, THE SNAKE PEOPLE and ISLE OF THE LIVING DEAD. Stars Boris Karloff. CLICK IMAGE FOR DETAILS. A giant octopus slithers out the sea to terrorize San Francisco! A great 50's giant-monster flick with top-flight animation from Ray Harryhausen. The greatest comedian in the monster business! This is a full feature stand-up comedy show filmed at the Monster Bash Conference, totally aimed at the classic monster movie fans. Don Reese is a cross between the story-telling of Bill Cosby and the twisted humor of Brother Theodore. A MUST HAVE! One of the great movies to kick off the science fiction craze of the 50's. Richard Carlson stars in a story by Ray Bradbury. Aliens invade and take control of people's bodies. CLICK IMAGE FOR DETAILS. Stars Evelyn Brent, Reginald DEnny, Jack La Rue and Inez Courtney. Murders begin happening that match the murders in a current broadway play. CLICK IMAGE FOR DETAILS. IT (1967) Roddy McDowell. A museum assistant stumbles upon a stone figure becomes a living creature of murder. THE SHUTTERED ROOM (1966) A young hip couple in the swinging 1960s are plunged into Gothic horror. A tale of creepy madness from H.P. Lovecraft. A spaceship crew isolated in space with an alien aboard. A huge lizard man (Ray "Crash" Corrigan) rips through metal hatches and stalks the crew. Horrifying and claustrophobic with Marshall Thompson. CLICK IMAGE FOR DETAILS. Releases May, 19, 2015. A spaceship crew isolated in space with an alien aboard. A huge lizard man (Ray "Crash" Corrigan) rips through metal hatches and stalks the crew. Horrifying and claustrophobic with Marshall Thompson. Watch out! Watch Out...in the air ducts...there IT is! Stars James Stewart and Donna Reed. The truly classic movie that brings all the emotion of the season of giving. A man wonders if it's worth it to go on living...maybe his family would be better without him. An angel intervenes. Double Feature: IT'S ALIVE (1969)/IN THE YEAR 2889 (1967). CLICK IMAGE FOR DETAILS. IT'S ALIVE (1968)/WAR OF THE ROBOTS (1978) - Double Feature. CLICK IMAGE FOR DETAILS.